Tough Tech Choices: Laptops, Tablets, Chromebooks, BYOD? I began my education career right out of college in the fall of 1992. My first teaching job was at Brewster Academy, a small boarding school in central New Hampshire. That year, the school began planning efforts that led to one of the nation's first 1-to-1 learning programs. Little did I know that, only a decade later, I'd be working in a small gray office cubicle in the Maine Department of Education, helping lead the nation's first statewide 1-to-1 learning program: the Maine Learning Technology Initiative (MLTI). One of my responsibilities as Maine's coordinator of education technology was buying the technology and associated services for the MLTI. To say that I've been responsible for buying a lot of computers (and tablets) is an understatement. It's from this perspective that I share some thoughts about the selection and purchasing of students' primary learning devices. There are generally two purchasing models: The district pays, or families pay (bring your own device/BYOD). In some instances, I've seen a cost-sharing model. Many BYOD programs have attempted to mitigate economic disparity by budgeting district funds to buy devices for families that qualify for free and reduced lunch. However, I argue that doing so can jeopardize student privacy and security. By using district funds to buy devices for these families, the district makes visible which students have means and which do not. Districts should seriously consider whether this practice violates student privacy. Another option, a district-purchased device for all students, also has its challenges, but I believe those are outweighed by the benefits. Economically, a BYOD program means less spending by the district because spending has been shifted to the family. However, the district-purchased option can be less expensive overall to the community since districts qualify for educational discounts. Depending on the size of the district, competitive bidding and subsequent negotiations can be a significant cost saver to the community as well. A district-purchased program also tends to lead to a standardized device. I learned from the mission statement of my second school, the Allendale Columbia School in New York, that "structure should liberate, not confine." While some in your community may want the personalization that BYOD affords, the device you select should be a proverbial Swiss Army Knife. Personalization shouldn't focus on variations in design, color, brand or operating system so much as the capacity to shape how an individual interacts, creates and consumes media with the device. This leads to one of the most critical considerations: What do you envision students and teachers doing with the devices? If your conversations have been dominated by gigabytes, screen size, operating systems and cost, then you should ask yourself: "Am I choosing a device based on my education goals? Or are my goals being defined by my device?" If you believe that structure should liberate, not confine, then seek a solution that solves for your educational goals, not the other way around. Use the SAMR model of technology integration developed by Dr. Ruben Puentedura to help guide discussions about how the technology will be used — how it will change how teachers teach and students learn. You can use Common Sense Education's quick video introduction to SAMR along with videos and blog posts written by Dr. Puentedura; also, the MLTI iTunes U page hosts an excellent podcast series by Dr. Puentedura himself. An additional benefit to using this or another model is it will provide a common vocabulary for your school community to discuss technology use. Broad terms such as "integrating technology" are better defined, and, as a result, discussions can be more meaningful and useful. With a model like SAMR in hand, you can define your educational vision and goals. This will help you better determine your device needs. As you go along, note who is involved. Including students and teachers is important. Remember: Your students outnumber the teachers by a large margin, and they'll be the most common user of the device. Never assume what they want or what will be easy or hard for them, and don't project your perspective on student-facing tools. Otherwise, you're allowing what I like to call Adult Paradigm Paralysis Syndrome (APPS) to drive your thinking. Go ask a student. Finally, let's get to the more nitty-gritty aspects. What about tablets versus laptops? Or a Chromebook versus a traditional computer? These are some questions to consider. What age are the students? I mentioned the benefit of a standardized device, but in a real-world context, that may mean one standard for early elementary students, which differs from that for upper elementary, middle or high school students. Your students' developmental needs are an important factor. Which devices do the teachers need? Whichever device you select for students you should also distribute to the teachers. That may mean teachers have two devices. 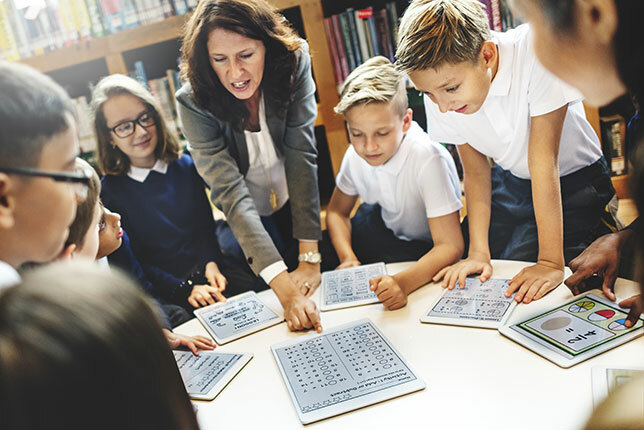 Teachers' needs are different from students'; institutional realities may mean compatibility and productivity needs that aren't met by the student device. However, if the teacher doesn't have a student device, how will she be able to fully understand the student experience? How can the teacher test that the resources she creates or curates are fully compatible on the student device? What type of software is needed? The software you use is as critical as the device itself. Productivity software is still highly leveraged by students and teachers. Don't ignore it, but also don't fixate on it. Beyond the productivity suite are tools that facilitate communication, collaboration and creativity. Additionally, consider visualization, modeling, simulation and gaming. You may decide you don't need all these tools, but it's better to at least consider them than discover later that you need them. How much storage space will we need? Increasingly, schools are leveraging rich digital content. Much of this content is accessible over the Internet but is often stored on the device itself. For storage of content and space for creativity, don't skimp on storage capacity! Even when content is accessible online, remember that not all students will have ready access to high-quality broadband outside of school. What can we afford? Delay looking at cost for as long as you can. Seek the solution that suits your needs, and then try to find a way to pay for it. If you quickly rule out options purely on cost, you'll likely settle for a solution that doesn't really meet your needs. I always prefer to justify the cost of a solution than to try to justify why students or teachers can't do what you agree to be educationally sound and desirable. Though the cost of computing devices has fallen in recent years, you will still find that inexpensive devices can come with hidden or indirect costs. Those costs aren't reason to avoid inexpensive devices, but you want to make sure you have accounted for the total cost of ownership (TCO) as best you can. What you may save in cost of the device may be spent on bandwidth. Or, more expensive devices may have a longer lifetime than less expensive alternatives. For more on this topic, watch our webinar "The Art of Procurement — Balancing Price and Performance."